What is your status? I had heard that you had been talking to a few NFL teams about a free agent contract. Back in 2008 the gang here at VandyPride conducted some interviews from some notable competitors in the SEC. 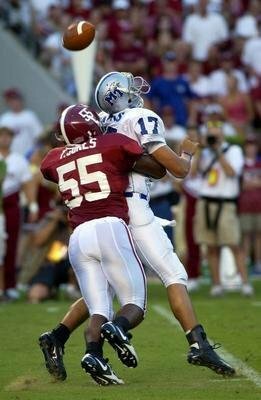 Terrence Jones was a linebacker at Alabama under Mike Shula. 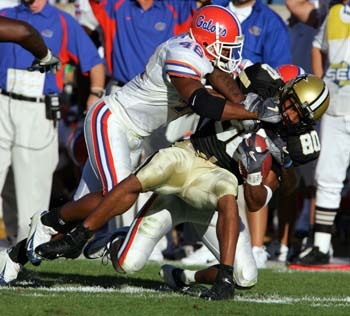 We talked to Terrance about his time in Tuscaloosa and playing in the SEC. Terrence, thanks for talking to us today. Tell us what you’ve been up to lately? Lately I’ve been finishing up my degree at the U.A. I graduate in August. I’m considering following Joe Kine to Texas A&M to be a graduate assistant to him if I don’t make any football team whether its the NFL, AFL, Canadian, or AAFL. Tell us a little about the AAFL. Why did you decide to come to Vanderbilt? Very few schools can off er a student-athlete what Vanderbilt does. I couldn’t pass up the opportunity to go to an elite academic institution and play in an elite football conference. I’d always wanted to play in the SEC and Vanderbilt also gave me an opportunity to pursue my academic aspirations. 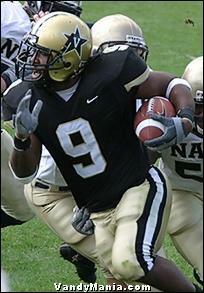 Not to mention, I believe Vandy was ranked #2 in the nation in defense 2 years before I got there. That was impressive. I’m most proud of being named the 2002 Most Valuable Defensive Back. 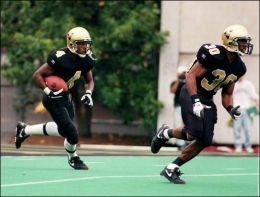 Vanderbilt has always been strong at that position so to be recognized in that manner was very special. Damien, what have you been up to lately? I’m still in Nashville married with 3 little ones. I work full time in the ministry and in my spare time hit the “links” on occasion. I’d say the perfect blend of academics and football. You can’t beat playing in one of the top conferences along with getting a great education. Also the year before I signed, they went 5-6 so I felt they were headed in the right direction. Did you reconsider your decision after Coach Dinardo left for LSU? No. By that time I was committed to the school and my teammates and my allegiance wasn’t to a coach but to the team. What do you think the biggest difference in Coach Widenhofer and Coach Dowhower’s coaching styles? Tell us what you’ve been up to. I understand you are teaching at Brentwood Academy. I am teaching 8th grade Bible and Leadership and coaching football and track at Brentwood Academy, but in the fall I will be headed back to graduate school to pursue a Masters and, perhaps, a Ph.D. in African American Studies. I guess I just kind of fell into it. I originally came to BA to just coach and they asked me if I would be interested in teaching a class and the rest is history. I plan to continue to teach after graduate school, so I guess it was a good call. How excited are you to have an opportunity you to have an opportunity to play in Jacksonville? I’m so excited. I leave for Jacksonville on Thursday. I had the opportunity to play against the best competition here in the SEC and prove myself. It’s been my dream for a long time. I’m living on a cloud right now. Shelton, thank you for taking the time to talk to us today. Your story is very inspiring. You signed with the Miami Dolphins as a free agent after you graduated from Vanderbilt. You were cut and then played in the Canadian Football League. You did well there and received a tryout with the Bucs. You took advantage of that opportunity and wound up a few years later with a spot in the Pro Bowl and a Super Bowl ring. Did you ever in your wildest dreams that you would have such a great career? Thanks for taking the time Brandon, tell us what you’ve been up to. I’m not sure if a lot of people know, but I was involved in a very serious car accident on September 29, 2007. I was hospitalized for five days, suffered a dislocated hip and was out of work for a month. I want to let everyone know that I am on my way to a full recovery. I just want to thank everyone for keeping me in their prayers, it definitely helped. I have been recently cleared by my doctor and my physical therapist and am beginning to get back to my old self. If God permits, I would like to be running routes and catching passes again on some professional level. But right now I am enjoying teaching and coaching wide receivers at my alma mater, St. Augustine High School in New Orleans. Norval, thanks for taking time out of your busy schedule to talk to us. I understand you are going to play in the AAFL. The new league that starts this spring. Can you tell us a little about that? The new professional league is to debut this spring. Its a new league created to give an incentive to student athletes to stay in school and earn their degree. You must have graduated from college and used all of your years of eligibility. I did 3 different workouts for the league, and was recently drafted to the Florida Team. I will go to camp in Mobile Alabama in March and try to make the team. Also, I heard that are teaching in Georgia. Who/what inspired you to become a teacher?